Craps Odds - What are These Craps Odds? Played around a table with just two dice, craps falls into the league of simple-to-understand gambling pastimes. The tricky bit may be understanding the different types of bets that can be taken. Reading up about the game’s rules and practicing online for free will go a long way improving your game. The aim of craps is to wager on the outcome of two thrown dice. 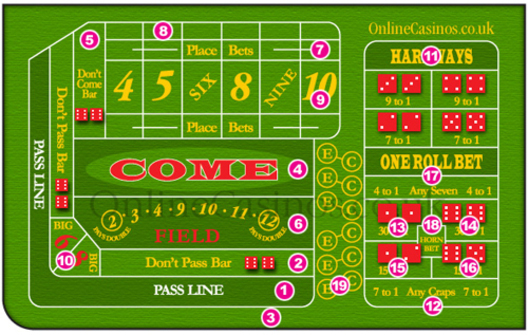 The game is played around a specially designed craps table on which players place their bets. Several gamblers at a time – usually up to 20 - play around this table; however craps is played against the dealer of the house. There are traditionally four to five attendants around a craps table, including two base dealers whose job it is to take bets on either side of the craps table. The dice are the single most important element of the game and are regularly checked for gaming fitness. The craps table is divided into three sides known as the left side, center side and right side. Areas within each side are as follows: Pass and Don’t Pass Line Bets; Come and Don’t Come Bets; Odds Bets; Place Bets and Field Bets. There is a wide variety of betting options around a craps table and players should familiarize themselves with several of the main ones before they begin playing. The Pass Line Bet – The first dice roll in a game is called the come out roll. The player can wager that the come out roll will total 7 or 11 and therefore the Pass Line Bet wins. This bet loses if the come out roll is 2, 3 or 12. Any other number becomes the Point, the dealer moves wagers to the numbered position on the craps table and this bet will only win if the Point number turns up before a 7 or 11. Don’t Pass Line Bet – Opposite to Pass Line Bet in that if a 7 or 11 is thrown on the come out roll, this bet is lost. Come Bet – Made any time during the shooter’s game. This bet predicts what the next roll of dice will be. If 7 or 11 are thrown, for example, the come bet wins, although if a two, three or twelve are thrown, the come bet loses. Place Bet – Once the point number has been determined in the game, a place bet can be made. Wagers are placed on any of the following numbers: 4, 5, 6,8, 9, 10. If any of these numbers are rolled before the number seven is rolled, this bet wins. If a seven is rolled before the number, it loses. Proposition Bets – Chips are placed on one of the proposition bet boxes and the next roll of the dice determines whether the player will win or lose this bet. Examples of a proposition bet include the Any Craps box, which means that the player is hoping for a 2, 3 or 12 to be thrown, or the Ace Deuce box which calls or the number 3 to be thrown. Players place their bets on the craps table. Turns are taken to be Shooter, ie. the player who rolls the dice. The dice only passes onto the next player according to specific throws called the Shooter Rule. The dice are rolled and the dealer sees which bets win and which lose at the game. Winning bets are paid out and the table is cleared for the next round of playing.